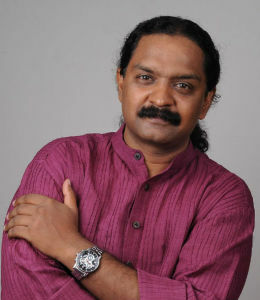 Dr. Sreevalsan J Menon is a leading Carnatic Musician and Music Composer from Kerala. Known for the spiritual quality of his renditions, Sreevalsan's carnatic music style is marked by a majestic sweep in Krithi rendering, brevity in alapana, meaningful Niraval elaborations; all in sync with a perfect alignment to Sruthi . After initial training under Rajalakshmi Krishnan (disciple of Chembai Vaidyanatha Bhagavathar) and violinist T.V. Ramani at Thrissur, Menon had much of his advanced tutelage under the Late Neyyattinkara Vasudevan. Menon . He underwent Training in true Gurukula pattern and served his Guru Shri Vasudevan for 18 years. Sreevalsan is an 'A' grade artist of All India Radio and has given concerts all over the country including the National Concerts of AIR and Doordarshan. He has received several awards including the Kerala Sangeetha Nataka Akademi Award 2013, awards from the Madras Music Academy, besides such institutions of repute in the Deccan. His jugalbandis with Hindustani vocalist Ramesh Narayan and late Kathakali musicians Kalamandalam Sankaran Embranthiri and Kalamandalam Hyderali have been widely appreciated. Sreevalsan has also carved a niche area for himself through his thematic musical productions on the Rains, Seasons, Rasas, Temples of Kerala etc. His collaborative works with M T Vasudevan Nair (music of Vanaprastham), Kalamadalam Gopi and Artiste Namboothiri all have brought him critical acclaim and recognition. Sreevalsan's music received global acclaim when his songs "I Be Here" and "I Have Secrets" and his background score for Hollywood Movie Saint Dracula was shortlisted for Songs and Original Score at the 85th Academy Awards - the 2013 Oscars.